September is #PADawareness month. Do you know the signs & symptoms? Find out if you’re at risk for a condition that affects over 18 million Americans. 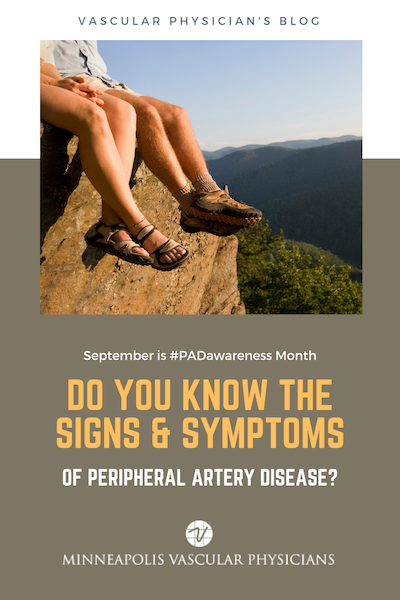 September is Peripheral Artery Disease (PAD) awareness month, and Minneapolis Vascular Physicians wants to make sure you’re prepared to recognize the signs and symptoms of this disease. PAD is a chronic circulatory condition, which affects approximately 18 million Americans. This disease causes narrowing or blockage of the vessels that carry blood from the heart to the legs, making you at higher risk for heart attack, stroke, and more. The Cardiovascular Coalition (CVC) states that over the past 10 years, PAD diagnosis has increased by 24% (164-202 million people overall). If left untreated, PAD can result in critical limb ischemia (CLI) which results in various limb amputations. The CVC also shows 160,000 -180,000 Americans will have limbs amputated this year as a result of this disease. Risk factors identified by the Center for Disease Control (CDC) include; smoking, diabetes, high blood pressure, high cholesterol, those with kidney disease, and those over 60 years old. How does my doctor diagnose PAD? Your doctor may use the Ankle-brachial index (ABI) test for diagnosis. During this test, your doctor will use a regular blood pressure cuff to take and compare the blood pressure in your ankles with the blood pressure in your arm. Imaging modalities, such as ultrasound or CT( cat) scan may also be used. What are my treatment options for PAD? Your doctor may require you to make several lifestyle changes (i.e., healthy diet, quitting smoking, regular exercise, take control of other health conditions such as high blood pressure or diabetes). Your doctor may also have you fulfill a healthy foot and skin care regimen to prevent infection and reduce complications of PAD. An antiplatelet medication may also be prescribed to reduce the risk of heart attack or stroke. Studies have also suggested that early vascular care intervention show an increase in life expectancy in PAD patients.